Research conducted by the Business Research Centre of the Italy-China Foundation (Centro Studi per l’Impresa della Fondazione Italia Cina, CeSIF) has shown that, in 2016, 122 million Chinese tourists travelled abroad (4.3 percent more than 2015), and that Italy alone welcomed 3.79 million Chinese tourists, showing a year-on-year growth of 12 percent. These numbers, as impressive as they may already seem, are bound to further increase thanks to an expanding Chinese upper-middle class. When it comes to analysing the real impact of Chinese tourism in Italy, one of the key indicators to bear in mind is the share of the spending capacity of Chinese tourists compared to that of tourists from other foreign countries. As pointed out by Global Blue, the spending capacity of this group in Italy has held on to its leadership position, albeit recording a slight contraction between 2015 and 2016. 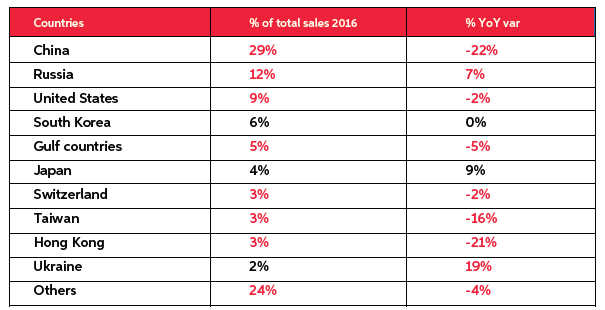 As shown in the table below, the share of total sales to Chinese tourists is more than double that to Russian tourists – 29 and 12 percent, respectively. If we then consider the aggregate shares of sales to tourists from all of the Asian countries listed in the ranking (China, South Korea, Japan, Taiwan, Hong Kong), total sales reach almost 50 percent. 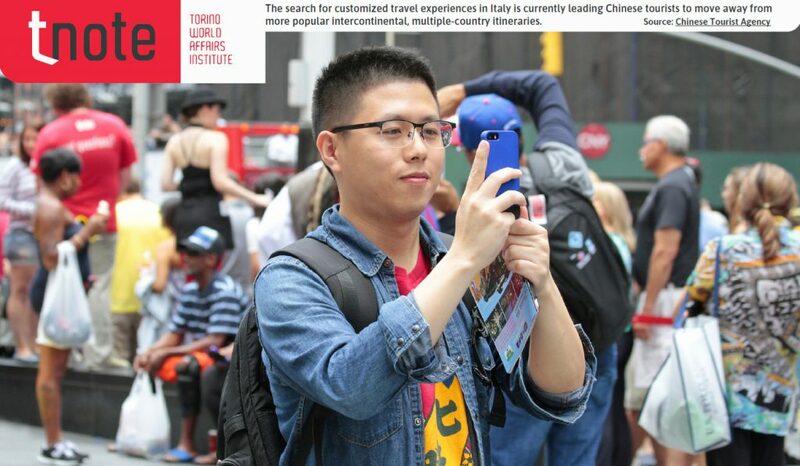 The soaring numbers of Chinese outbound tourism that we will witness in the coming years, which will triple by 2030, should compel Italians to think seriously and strategically about how they intend to adapt their reception capacity to a country that has proven to be widely attracted by Made in Italy products, most notably luxury goods. Indeed, almost 90 percent of all purchases made by Chinese tourists in Italy benefit the fashion (clothing and leather goods) and jewellery industries. Why exactly would Italian reception capacity be a matter of concern? According to the latest Hurun Chinese Luxury Consumer Survey, Italy has been steadily losing ground in the rankings as the preferred destination for Chinese luxury tourism. 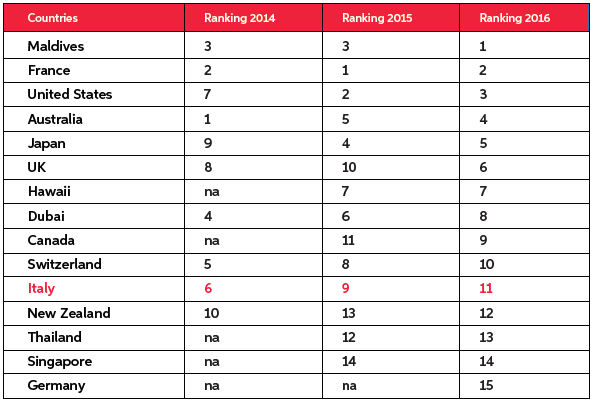 As shown in the table below, Italy has dropped five positions since 2014, ranking 11th in 2016. For a country like Italy, which boasts the highest number of UNESCO World Heritage sites in the world and is the eighth largest export economy (it exported US$ 455 billion in 2016), this drop more than justifies the attention that needs to be paid to Italy’s reception capacity. In fact, from a critical point of view, it makes us come to terms with two major challenges. First, Italy should aim for top ranking in this respect, especially given the growing appetite for luxury products coming from evermore brand-conscious lifestyle lovers who have significant personal wealth and an enormous spending capacity. Second, as long as luxury is also linked to cultural attractions, Italy should leverage its impressive and diversified artistic heritage and invest significantly in marketing cultural experiences that are customized for Chinese travellers, who are eager to discover unique historical sites. Chinese people have come to appreciate the rich history and culture of Italy they find in cities like Venice, Rome and Florence. Many of them consider Italy to be a romantic destination, while others are becoming increasingly aware of the quality of Italian wines and the tradition of Italian cuisine, considered to be part of an overall healthy diet. A key feature related to the demographics of Chinese travellers is that, among them, almost 40 percent are Millennials (between 25 and 35 years old): digital natives with a high income and very sophisticated taste when it comes to making purchase decisions. Chinese Millennials spend over three and a half hours a day online and love to shop for fashion and luxury items while they are travelling, mostly using mobile payments. This should not come as a surprise since e-commerce in China accounts for more than 20 percent of total retail purchases, with e-payments exceeding US$ 5.5 billion in 2016. That is 50 times more than the volume registered in the United States. Is Italy able to fully intercept travellers such as these, who are so captivated by its products? Yes, and there are two main reasons for it, which at the same time represent two big opportunities. First of all, a new web payment platform is available for Italian retailers: WeChat Pay. The mobile payment system of the most popular app in China, WeChat (1 million transactions per minute registered in 2017), is finally ready to roll out in Italy thanks to the agreement reached by the Chinese holding company Tencent, owner of the WeChat app, and key partners such as Digital Network and Docomo Digital. From now on, Chinese visitors who make purchases in Italy will be able to pay quickly with their smartphones: while retailers will have to get a dedicated payment terminal or to add WeChat Pay to the payment circuits accepted at the cashier, customers having a WeChat account connected to a bank account will simply pay via QR code in all authorized shops. WeChat Pay will be therefore a great tool for sales staff to build closer relationships with Chinese travellers, and luxury brands must ensure they align themselves with this new way of interacting with customers. Secondly, 2018 is the year of EU–China tourism. As such, it offers unique prospects for increasing the number of visits, hence promoting sustainable tourism, stimulating investment opportunities for both Europe and China, and underpinning the ongoing negotiations on EU–China visa facilitation. All this represents a terrific opportunity for Italian institutions and retailers, given that building an official presence on WeChat and aligning to the highest hospitality standards will allow them to engage more effectively with Chinese tourists. The opportunities are enormous, and we have no choice but to seize them.